Fried foods really tickle our taste buds. Now, if you try to simplify this frying process, an air fryer is the best solution to you. You may be familiar to blender, toaster or microwave oven. But, what is an air fryer? let’s present you with a clear idea on this appliance. 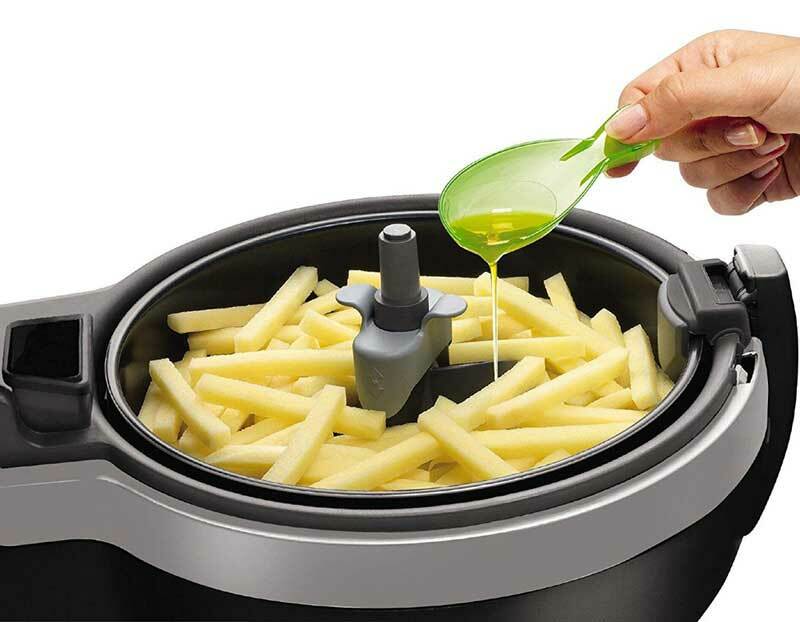 You may think that only the French fries or chips lovers would invest on a hot air fryer. The modern air fryers are something more than a simple frying device. From grilling to baking, you can do anything with this appliance. Moreover, you may choose an air fryer as a gift for your health-conscious friends, they can cook delectable foods without adding too much oil. However, all the devices may not present you with the consistent result. Thus, we have helped you to pick the best air fryer of reliable brands. We reviewe the top 10 rated air fryers on the market, and you may easily choose the right one. How to choose an air fryer? Most of the potential buyers do not know that this air frying device is different from the deep fat fryers. While we deal with air fryer, it is a device, capable of cooking with low oil. It uses very limited oil or no oil for cooking chips or any food. It relies on hot air to do its task. However, when you have bought deep fat fryer, your ingredients have to swim in oil. The heated oil, used for preparing crispy chips, adds fat to the food. We think that the former one is the better option to stay fit. 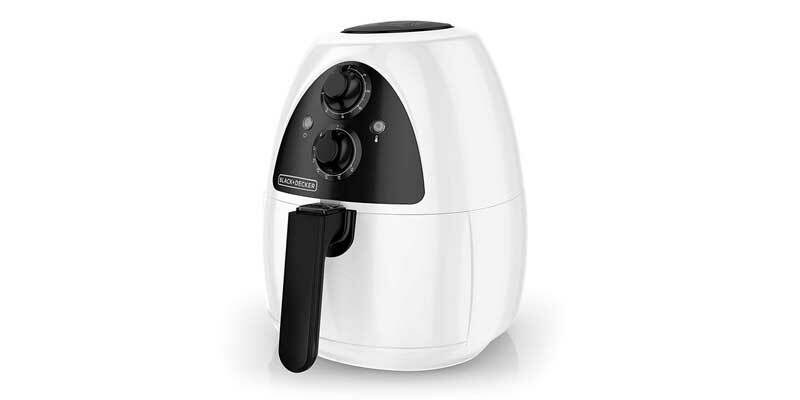 The small air fryers have the capacity, ranging from one to two liters. The capacity of medium sized units may range from 1.8 to 2.5 L, while for the larger ones it may be more than 5 L. To roast or cook the big chicken pieces, the large dryers are the right options. However, the families, comprises 4 to 5 members, a 2-L fryer may be the good choice. We have reviewed air fryers of various sizes. There are also fryers, having two food baskets. The design makes a difference to way of shaking foods, inside the fryer. You can find air fryers, having self-stirring ability. They have built-in paddle for stirring the ingredients until you have turned off the system. Thus, you won’t have to apply an effort for shaking foods manually. However, the way of stirring is not good for all the units, there is a chance of having unevenly cooked foods. For deep frying or low frying purpose, some users will choose these fryers. There are air fryers, integrated with pull-out basket. During the cooking session, you have to pull out the basket, and then shake the contents after every 4 to 5 minutes. It is intended for cooking the ingredients consistently. In most of the models, you will find an alarm or timer that reminds the need of shaking food. These units are good for preparing the grilled chicken or fish and baked veggies. The basket of this air fryer rotates automatically, making the device highly versatile. Thus, the ingredients, inside it, also move with it. You may find additional accessories, intended for baking, grilling and roasting. Temperature adjustability is the common feature to most of the modern air fryers. You have a chance of setting the right temperature that is best for preparing the chosen recipe. Every manufacturer mentions the lowest and highest temperature range and the rate of incrementing the level. Use the right buttons for regulating the temperature and serve the tasty foods. These are two categories of air fryer controls. The dial controls can be very basic, and they may not be highly accurate. You can find dials for timer and temperature, and this dial can ding after the set time is passed. Choose the timer that you may set for over thirty minutes. The air fryers, with LCD display, have digital controls. Their timer also works accurately. You will find preset or programmed settings. Buy the air fryers that have clear icons on the display. Most of the buyers look for the space-saving air fryers. While your countertop has very limited space, you may invest on the smaller units. The fryer consumes maximum of 1500 W of electricity. You may run the system for thirty minutes, and it won’t use too much electricity. For everyday cooking, the users usually use the device for fifteen minutes. Thus, you have to check out the power ratings of the fryers. It is essential to ensure that the electricity outlet of the kitchen sustains the Wattage with which the air fryer runs. The outlet must back up at least 800 to 1500W, this is the standard Wattage range of the air fryers. The fryers, having higher Watts, may reach the higher temperature very fast. 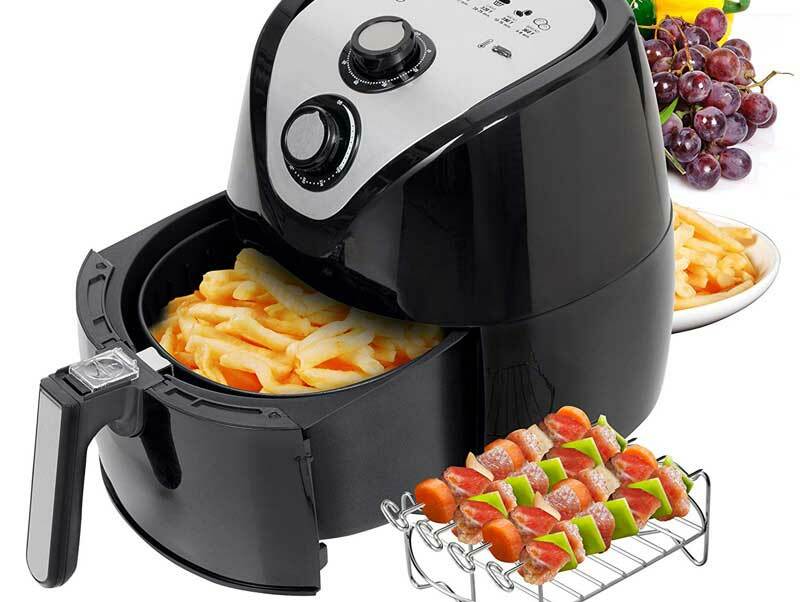 There are some air fryers, which have two compartments, enabling you to fry two types of dishes. Thus, you may prepare chips and steaks simultaneously without a chance of blending them. Just as any other appliance, cleaning is essential for air fryer. After using it every day, you must clean the parts. You may check out whether these parts are dishwasher safe. Usually, the lid, basket and stirrers are the parts to be cleaned. 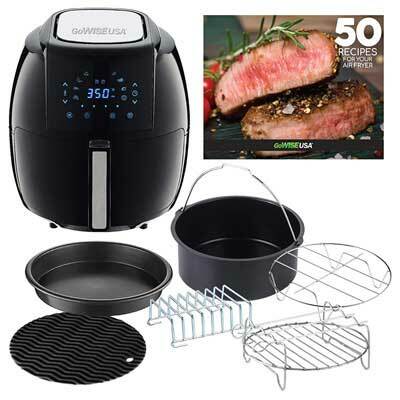 This is a free item that we have found in most of the best air fryer packages. The air fryer recipes give you a guide in preparing different dishes by using the chosen air fryer. GoWISE USA is a Ming’s Mark brand, headquartered in Phoenix, AZ. They began by introducing Pressure Cookers here in the USA. But now their Air Fryers are very popular in the USA. GoWISE USA products are ETL certified and FDA approved. Cozyna air fryers launched in 2014 and have been perfected over the years to bring users the best quality air fryers in the world. As a well-known brand, Philips’ air fryer has excellent quality and creative design. And Philips Air fryer also creates less smell and splattering than conventional fryers, it is easy to clean, safe and economical for your daily use! BLACK and DECKER is also a really famous series. And if you are looking for a manual model air fryer, the BLACK and DECKER would be your best choice. The secret to the Power Air Fryer XL is Rapid Air Technology that cooks foods with a whirlwind of super-heated air for that great crispy-fried taste without all the added fat and calories! Della, find all your food service supplies in one convenient place. Della offers common necessities like cookware, kitchen appliances, and traditional tableware. The NuWave Air Fryer uses hot air in combination with high-speed air circulation to perfectly cook your favorite fried foods. 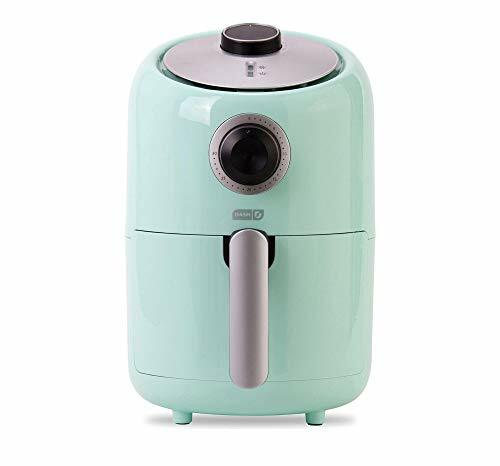 GoWISE has designed an innovative air fryer, available in various colors: Chili red, blush, majestic yellow, mist, plum, teal, white and universal. You may pick any of these air fryers to match it with the theme of your kitchen. 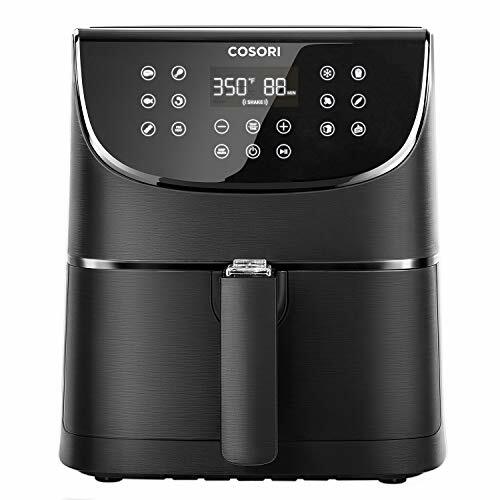 For those, who love low-calorie foods every day, this GoWISE air fryer is the right choice. You can fry your steaks and cook crispy pizza with the use of this appliance. By adding few drops of oil or by avoiding any oil, you may roast, grill or bake your ingredients. This is one of the most versatile air fryers. This GoWISE air fryer looks very attractive due to its sleek design. Place it on your kitchen countertop and get advantage of its functionality and aesthetic value. Although GoWISE has released smaller versions, we have chosen its 5.8 Qt version. You will be able to serve 4 to 6 members at a time. You may put four drumsticks or four chicken breasts into the system. The metal-made cooking basket is non-sticky due to its Calphalon coating. From the customer reviews for GoWISE air fryer, we have found that the users especially love its integrated smart programmable features. There are different preset programs, helping you to cook cake, pizza, fish, chicken, shrimp, steak, pork and chips. If you are using hot air fryer for the first time, you will surely find them useful. However, there is also an option for adjusting temperature range (an increment of 10 degrees) that varies from minimum 180 degrees to 400 degrees Fahrenheit. The touch-sensitive LCD panel makes your task easier. There are plus and minus signs for controlling the temperature. The timer can be set up to thirty minutes. You may also set the alarm for shaking the ingredients after five to ten minutes. Among other features, there is a PFOA free and FDA-approved pan. Get the pan detached from basket, and then transfer all the cooked foods to your bowl or plate. The handle has also cool touch technology for the comfort of the users. You will also find a button guard for the prevention of detachment accidentally. The package includes a helpful recipe booklet that you may use for preparing your dessert, dinner, lunch and breakfast. Read all the recipes and try them out. 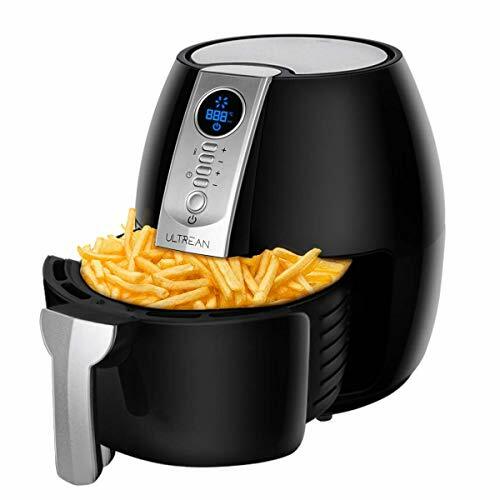 Cozyna has offered the best air fryer with high versatility. Use this device for baking, roasting, frying and grilling foods. You may fry your potato slices, grill your meat or bake some food. Thus, this small device does everything for you. The size is very compact, and you may purchase it for placing the device on the small kitchen. Its capacity is 3.7QT, and this the best choice for medium or small sized family. You may serve two to three adult members of your family at a time. It is an elegant colored, stylish looking fryer, made of plastic. Although it can become hot at the time of cooking, it won’t injure you. The interior basket has Teflon coating, the non-stick cooking surface prevents your ingredients to stick to it. And you won’t have to scrub the basket with efforts to remove the food bits. Cozyna Air fryer enables you to keep away from calories and save money. While a conventional-style deep fryer needs much oil, this device does its work without much grease. Due to this advantage, we call it as the zero-guilt system, that mean you won’t get fat in your food. In addition to it, the fastest air circulation helps in cooking the food uniformly. Temperature level for this device is adjustable, and you may raise it to 392 degrees. This is a very high temperature for cooking chicken. However, at a lower temperature, you will also cook various other foods. The timer, equipped with the appliance, is very convenient to you. You may set it to thirty minutes for frying the foods, after the set time is over, this fryer gets turned off. Now, let’s say about the display of this fryer. While most of other fryers have digital display, this unit has an analog one. There are two controls for regulating the time and temperature. Although the display is functional, you will not find a refined look. There is also a free cookbook, included in the package. You can find more than fifty recipes in this book. For those, who haven’t got it in their package, there is an e-book available from the seller(Ask them send the e-book via email). From the customer reviews for the air fryers, we have found another model from GoWise. This is one of the fantastic devices, helping you to prepare delicious meals every day. The GoWise air fryer enables you in frying, grilling, baking and roasting the foods at the right temperature. This is really a very high-quality fryer, designed with fourth generation technology. One of the best features of this air fryer is the Rapid Air Technology. The fan rotates at a higher speed, and that’s why hot air circulates uniformly throughout the basket. It helps in cooking all the parts of your food. Get the hot, tasty foods at your home easily. This best air fryer has touch screen or digital display that is usable for the adjustment of temperature. There are 7 built-in programs, useful for preparing the meals, including chips, fishes, shrimps, chicken and many more. You may also manually control the settings. This GoWise air fryer can hold 3.7 quarts of foods, but you can easily serve 4 to 6 people at a time. The health-conscious users love this device as it helps them in cooking low-cholesterol foods. The temperature may range from minimum 175° to 400°Fahrenheit. You can create crispy and juicy foods. Set its timer to 30 minutes. You may also use the standby mode of the timer. It is very easy to operate this air fryer. You have to organize and put your ingredients into the detachable food tray of this device. Then set its timer, focusing on the meal type to be prepared. The device can get deactivated automatically while your foods are ready. This GoWise Air Fryer is equipped with a baking pan, having non-stick coating. This pan is also integrated with a handle. Other useful accessories, included in the package, are racks and skewers. For instance, the rack is intended for creating an additional cooking surface layer. Button guard, another useful feature, is located at the base portion of the air fryer. It makes sure that the basket remains intact in its position at the time of cooking food. 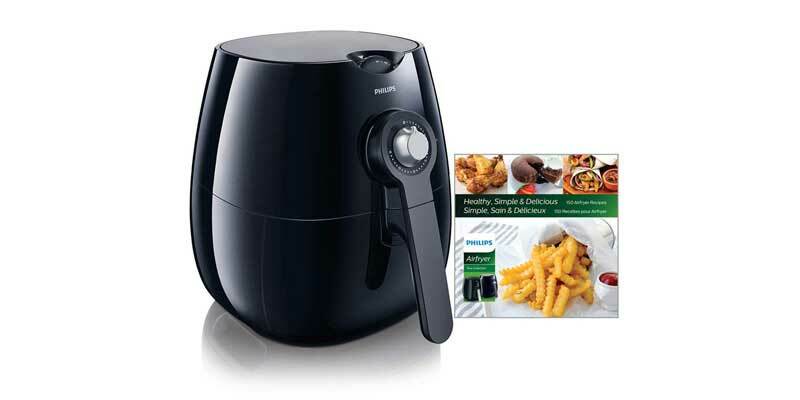 Philips has offered one of the superb air fryers that can simplify your task of frying healthy foods. 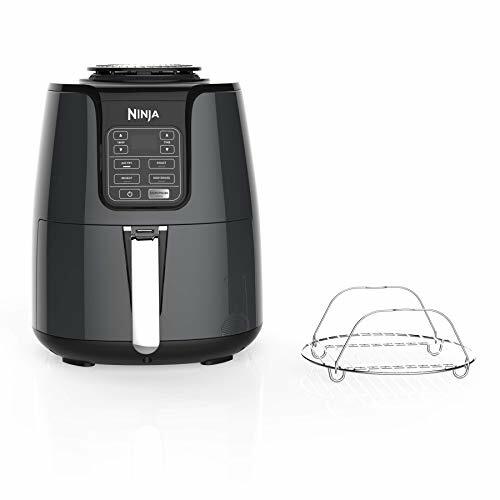 This Philips Viva Air fryer has a very compact design, and it fits best on any worktop of a kitchen. It is thin and tall in shape, and its main body is made of plastic. On its top, you can find a fan and heating unit. At the base part, there is a drawer, and by dragging this drawer, you will get a cooking basket. The manufacturer has used metal mesh for designing the base of this basket. The size of the frying basket is 28 oz. Air may pass through it, hitting the drawer’s base for the circulation of air. There are very simple controls with a dial, present at its top. This helps in setting temperature. The temperature level usually ranges from 80 to 200°C. You will also find a button for timer. At the rear side, you will get a storage unit for storing the cord. 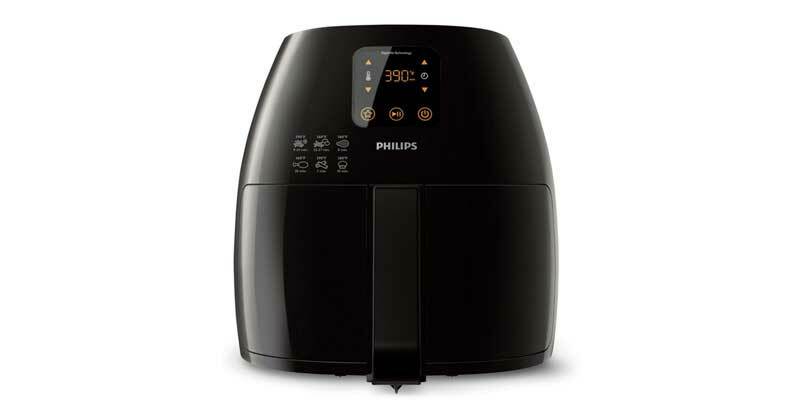 This Philips air fryer is designed for cooking 800 grams of chips. You have to add very little amount of oil to prepare these chips, you will enjoy 75 percent less fat in these cooked chips. Other rotary fryers take more than twenty minutes for frying chips at 180°C. However, Philips’ air fryer can do it at 160°C, and its wedges are also larger. Although the chips are not oily, you will still find a good taste from them. While reading various air fryer reviews, we have learned that conventional oven takes forty minutes for cooking chicken wings. However, this air fryer does the task within twenty-four minutes. Philips has chosen Rapid Air technology for the uniform distribution of the hot air to cook your food easily. The starfish design at the base plays the most important role in this case, and the device helps you in grilling, baking and frying foods. It is very easy to clean this best air fryer. 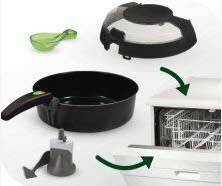 The drawer has non-stick coating, and it is removable to help you in cleaning easily. The integrated basket of the device is also dishwasher friendly. Viva Air fryer package also includes recipe book, where you get the guide of cooking drumsticks, cakes and spring rolls. This book comprises 150 recipes and is useful for most of the novice users. We have chosen another reliable small sized air fryer with a capacity of 2 liters. We think that the size is good for serving the members of a small family. You may prepare snacks for all the members at a time. You may get space for frying 8 chicken wings or 2 potatoes. Most other fryers have very large sized cooking basket, but this BLACK+DECKER air fryer is very compact in shape. 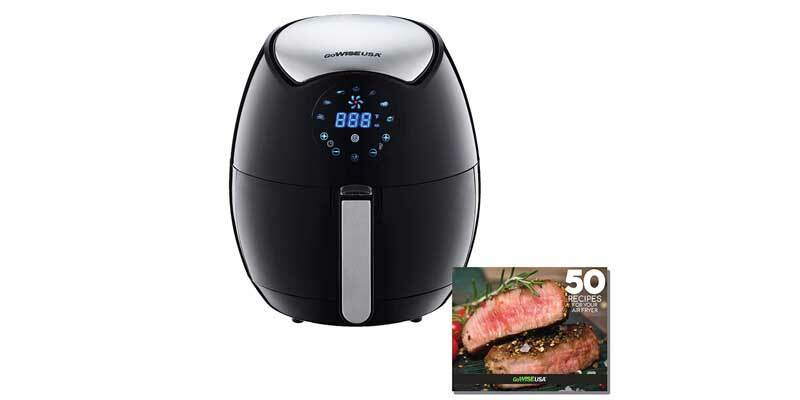 The combination of black and white in the design has made this air fryer look attractive. The unit is manufactured with plastic. However, we have found a stainless-steel finish on it, and this has added durability to the construction. And this material is also capable of holding up very high level of temperature. For cooking various types of foods by adjusting the temperature.The temperature level may range from 175 degrees to 400 degrees. You will also get a timer (60-minute) to prepare any dish precisely. When the set time is over, the system will become deactivated automatically. You will also find integrated indicator lights. One of these lights shows the activated mode, while another one reveals the deactivated status. There are two convection fans, attached to the device. The heating element adds heat to help this convention system for spreading the hot air throughout your foods uniformly. Within a short time, you will be able to prepare delicious and crispy foods. The fans are intended for browning your foods. And you won’t have to add too much oil for cooking your foods. Another positive feature of this fryer is the specially designed handle. You may hold the handle and take out the foods after the cooking process is over. The handle does not become hot at the time of frying foods. 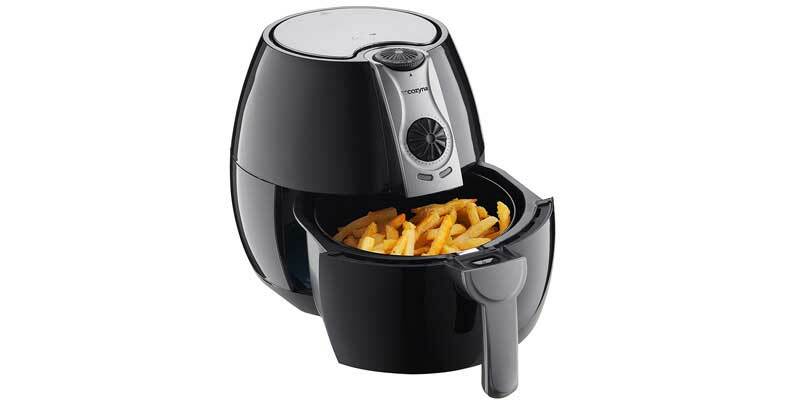 This BLACK+DECKER air fryer has different parts, like separator, pan and basket. All of them have non-stick coating. Thus, it’s very easy for you to clean these parts. Food particles won’t stick to the surface. You may use soapy water and a sponge for cleaning these units. In addition, you can also use a dishwasher to clean them. This is another revolutionized model from Philips. Make your cooking process easier by using this Philips air fryer. It helps in preparing the healthy meals with the minimal level of effort. The patented technology for rapid air circulation helps you in uniform heating of the foods or ingredients. For those, having cholesterol problems, this device works best. The foods, prepared with this device, contain 75 percent less fat. This Philips air fryer is the XL version, and that’s why you will get a device of big size. You may serve your party guests very easily, prepare your snacks without much trouble. This air fryer is designed for 6 different types of cooking process: baking, frying, steaming, roasting, sauteing and grilling. However, few users have complained that this device is not right for the steaming purpose. For any cooking style, you may add one spoon of oil or less than that. Although you like to have deep fried potatoes, you can still do it by avoiding too much oil. However, one major issue is that for steaming anything, we need to use water. The fryer’s basket is not designed to hold water safely, so you have to invest on a different pan for adding water. Temperature level can be increased to almost 390 degrees. The manufacturer has claimed that you may reach the highest level of temperature within few seconds. However, we have found that you have to wait some minutes for it. Still, the device works faster than ovens. There is an automatic Shut Off option, making the operation much easier. Some users do not use the alarm system, that is why Philips has not integrated this feature. But it has added a timer, with a capacity of running for one hour. Like other air fryers, this unit has also a digital screen, showing your smart buttons. You will also find a special program, helping you to prepare your preferred foods at a faster rate. The pre-set options include chops, chicken, fish, shrimps, fries and baked goods. There’re set time and temperature for all these items. It is very easy to alter the program, you have to hit M button for it. Another good feature is that the food basket and the non-stick coated drawer are removable, and they are also dishwasher-safe. 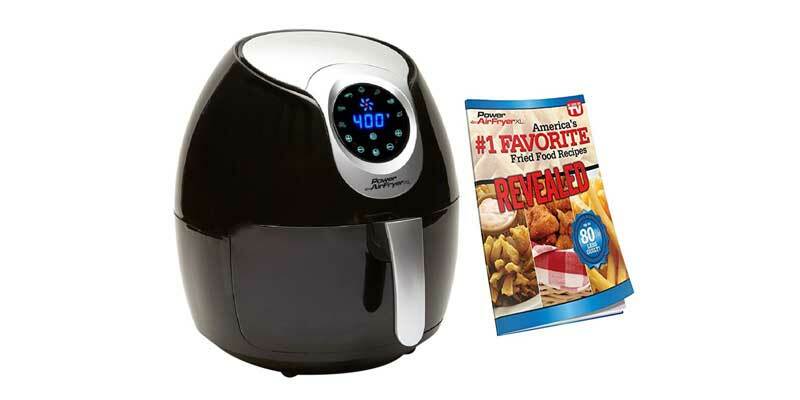 Power Air Fryer XL has designed one of the uniquely designed air fryers for its consumers. We have chosen the smaller version of Power air fryer. You can serve two to three guests. With a capacity of 3.4 QT, this air fryer is available in different colors. Use this appliance to eat less oily food and stay healthy. You may prepare fried food or baked food by using the air fryer. However, you won’t get much fatty content in it. There’s much cooking space in the device to hold the foods. The oval shaped copper basket is also of very high quality, and the manufacturer has used non-stick material for this basket. For roasting veggies or for preparing French fries, you may insert a basket divider. You will be able to cook various foods simultaneously. You can easily put your chicken pieces inside the fryer and fry them thoroughly. Due to the small size and lightweight structure, this device is portable. You may place it at any spot or move it to a different site. Although it is small, it is technologically sophisticated in function and design. You can heat the interior air to 400 degrees. This is a 6-in-1 system, helping you to perform various cooking processes, baking, sauteing, grilling, frying and steaming. Choose your recipe and then make out the right cooking style to accomplish the process. There is a digital timer on the top side of the device. By hitting the appropriate buttons, you will get your foods prepared. Automatic turn off feature is also present in this device by setting time of the timer. At the rear part, you can find the steam vent, designed for the escape of steam. The steam comes out of the rear side, and you won’t get injured while standing in front of the fryer. This Power Air Fryer uses 1500 watts and 120 V to function rightly. It is very easy to wash the unit. And you can clean the food basket since it doesn’t use much oil. There is also a recipe book, comprising more than 20 recipes. Della has gained a reputation in the consumer electronics market. Its air fryer is also of high quality and has reliable genuine. While you fry foods in conventional oven with much amount of oil, you may find the bad smell, emitted from them after some hours. However, the fried foods, prepared with this air fryer won’t cause this issue. You will not get the smell of grease in your kitchen. Moreover, the foods also taste better if you use this air fryer. This Della air fryer’s features are highly sophisticated, and you will also find the circulation of hot air throughout the cooking basket. For regulating temperature and timer, there are separate controls in the system. The deep-frying process with this fryer will help you in forming a brown layer on the food. Since the temperature level is adjustable, you may prepare soft foods or the crispy ones. The temperature can range from 180 to 390 Degrees. While the fryer system reaches the set temperature, the light indicator indicates you. There is also a timer to suit your needs. The fryer design is highly effective at cooking fresh or frozen foods. You may heat up the onion rings, French fries, veggies, chicken and eggrolls. The mesh cooking basket has the capacity of holding 5.8 QT of foods. You may easily cook dishes for all your family members. The basket is detachable by pressing one button, and you transfer your foods to your plates. The handgrip portion is comfortable to the users, and as it remains cool, you will be able to use it safely. Many of the parts of this best air fryer are removable, and you may clean them easily after your regular usage. 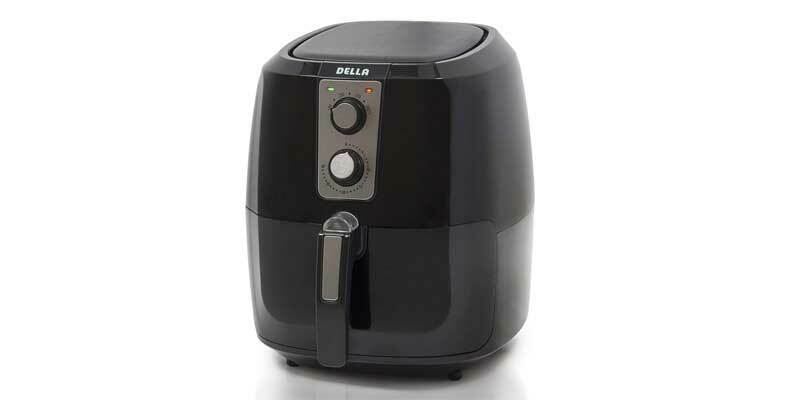 This Della air fryer is available in different colors, including black, red and white. 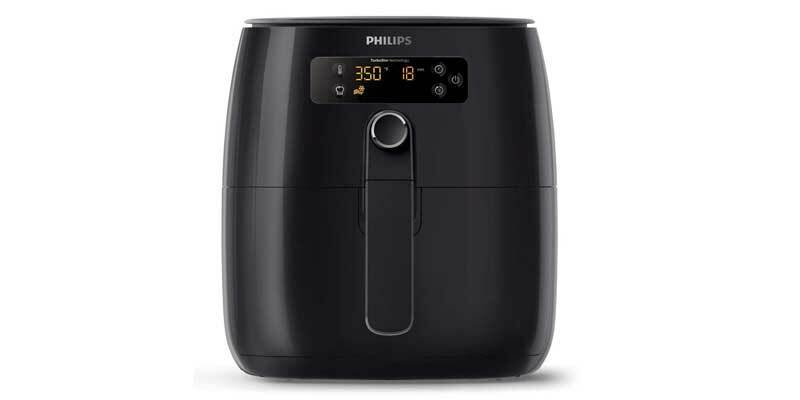 Although we have already reviewed Philips Air fryer, this device is slight different. However, like other models, it helps in preparing food with very low amount of oil. You may cook golden-brown colored foods that are not only attractive but also delicious. This air fryer is very small, having a capacity of 2.75QT. The uniqueness of the product lies in the integrated Turbo technology. The air gets superheated very fast for frying the foods. You won’t have to add much oil since air does this work for you. The latest TurboStar technology helps with the instant heating of this fryer. Philips Airfryer turns out the food that does not emit any awful smell. It is one of the major reasons for which you may prefer it over the conventional-style fryer. The users also like this device for its reasonable price. We have tested the cooked foods, prepared with this device. You will find fifty percent more consistency in the way it heats up your foods. You never like to find raw parts in your foods. The cooking basket has non-stick mesh that is removable. It is very easy to clean this basket with a dishwasher. There is also a drawer, coated with the non-stick material. Another feature for which we love this air fryer is the air fryer functionality. All your family members are busy with their own work, and all of them may not get a chance to have their meal at one time. But you can cook the foods anytime, this device has a special technology for retaining the heat of your food. After cooking the foods, you may delay thirty minutes to serve your guests. They will surely have the hot dishes and enjoy the desired taste. This Philips air fryer has also the common feature, like pre-set modes for grilling, roasting and baking foods. Enjoy your everyday cooking process with a simple click. There is also a QuickControl dial, helping you to control the system. By turning it, you may set the appropriate temperature level. The Start button helps you in triggering the cooking process. The device is equipped with EasyClick handle that you may remove from the fryer for cleaning or storing at any place. 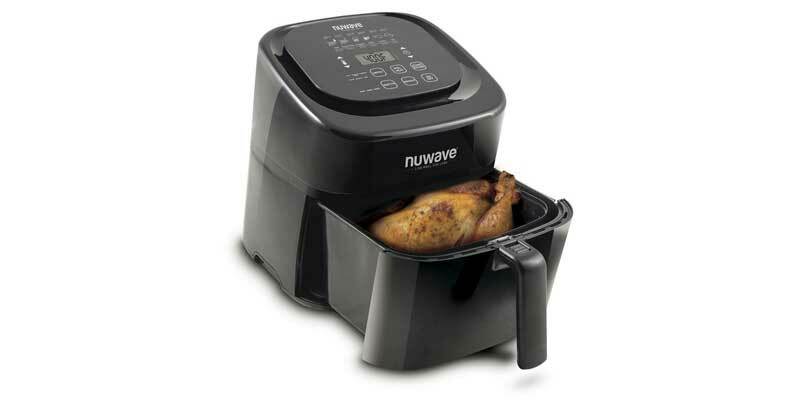 We have chosen the NuWave air fryer as the last product in our list of the best air fryer models. However, don’t think that its value is lower than that of other fryers. This is one of the superior fryers to lots of consumers. Most of the users have enjoyed uniformly cooked, tasty foods with this fryer. You may cook fishes, chicken, vegetables and several other ingredients. To make the device user-friendly, the manufacturer has inserted preset functions. There are preset temperatures for steaks, fish, poultry, chicken nuggets, fries and frozen fries. You have to touch Menu option for scrolling through the functions. The cooking space looks like a drawer, and you may fit 6-QT of foods in it. 6-Quart is a good size for serving a number of people. Before putting foods into the basket, you may preheat the system. The temperature and time controlling systems are also the best features of this fryer. There are up and down arrow signs, adjacent to a thermometer icon. The temperature ranges between 100 and 400 degrees. By pressing the up or down signs, you may increase or decrease the temperature by 50 degrees. The reheat function of the device has made it unique. You may easily heat up your leftover foods. At 360 degrees Fahrenheit, the system takes four minutes for reheating the foods. Fry pan is a common part for every air fryer. However, it has also a divider that you may use with this pan. This divider helps you in separating the basket into 2 parts. Thus, it becomes easy to cook 2 dishes with no risk of having a mess. Another distinctive feature is the Wattage controller. You will be able to control Wattage of the system simply by hitting a button. There are options for choosing 900W, 1500W or 1800W. The additional accessories that you get with the system are the rack and the baking pan. The baskets and all these accessories are dishwasher safe. You may also soak these parts in your soapy water for softening the food scraps. Then, use a cloth for cleaning them. Thus, cleaning the NuWave air fryer is not a hassle to you. Now, it’s the time to make decision on buying a best air fryer from our reviews. A very small investment will help you to prepare mozzarella sticks, chicken nuggets roasted nuts r baked foods. You may also treat your guests with grilled chicken. Buying an air fryer is the easiest way to limit your everyday calorie intake. Without adding oil, you can still get the yummy flavor and taste from your foods. For fried foods, the fryer forms a crispy, brown layer that is surely adorable to the foodies. We think that air fryer is also safest option as it does not pop oil out of it. Be the first to get the coolest reviews and updates! 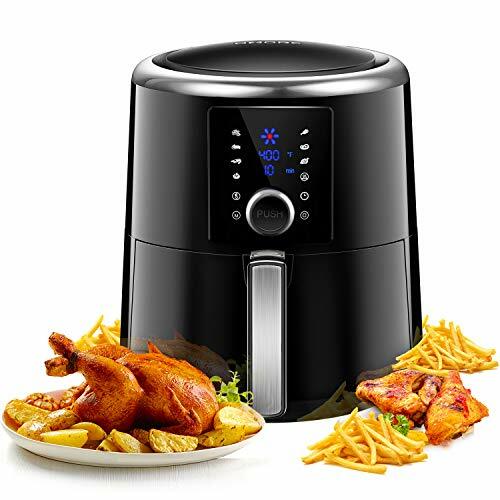 Thanks for the reviews, i love Power Air Fryer XL Air Fryer this Air Fryer fully cooks the chicken, fries, fish properly using the preset settings. Yes George, this list is in no particular order. Thank you for sharing your comments. 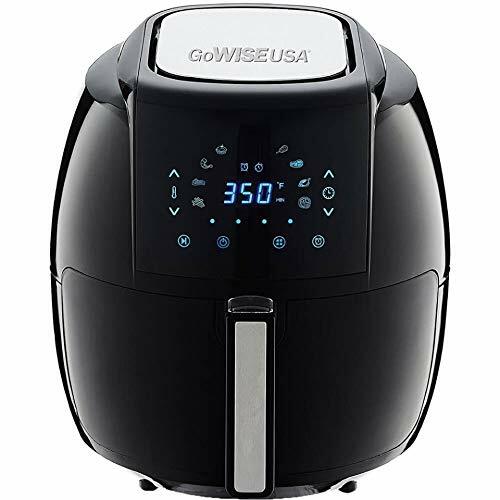 I decide to buy the GoWISE USA Air Fryer 7-in-1 Programmable(3.7QT ), and my budget is only $80, i think this is best for me. thanks. Philips HD9641/96 comes with over 200 recipes in app and free recipe book included. 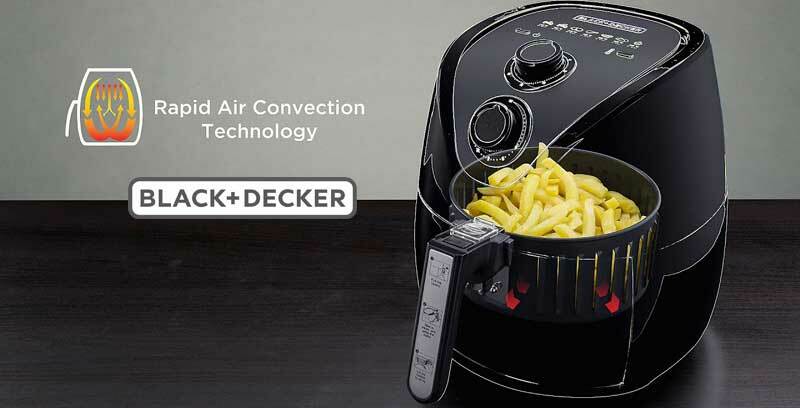 Anyone likes this BLACK+DECKER Air Fryer? i like it black+white design,really an eye catching design. How many chicken wings can cook with this Power Air Fryer XL Review: Turbo Cyclonic(3.4QT) at a time? You can cook 8-10 at once. 1. How to choose an air fryer? I’m Shawn Moore, an engineer and a tech gears enthusiast. 10AwesomeGears.com is a participant in the Amazon Services LLC Associates Program, an affiliate advertising program designed to provide a means for sites to earn advertising fees by advertising and linking to Amazon.com. Amazon, the Amazon logo, Amazonsupply, and the Amazonsupply logo are trademarks of Amazon.com, inc. or its affiliates. as an amazon associate we earn affiliate commissions from qualifying purchases.